When you're on the run from the law for securities fraud, you probably don't have time to log in and update your Facebook profile. 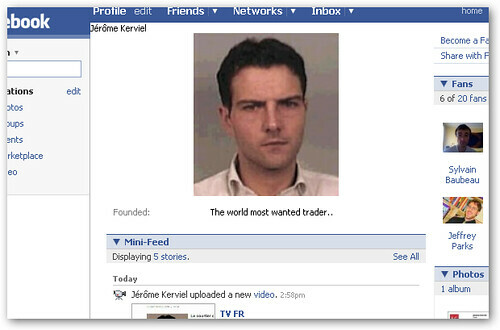 But the rogue French trader Jerome Kerviel doesn't have to worry since other Facebookers have created pages keeping track of the news surrounding his $7.1 billion trading loss. The former Société Générale (SocGen) employee was responsible for relatively simple plain vanilla futures hedging of European stock market indices, but he used his knowledge of internal bank controls to trade far larger sums than he was authorized to. After his superiors at SocGen discovered his activities, they hurriedly closed his positions, which may have caused the market crash on Monday. 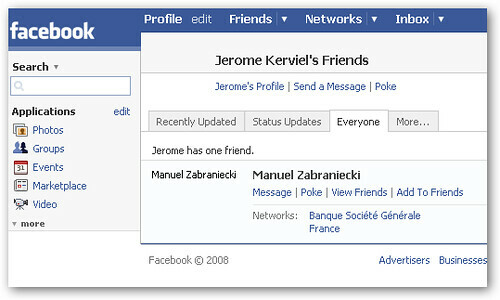 Apparently, Kerviel (part of the Banque Société Générale network) had 11 Facebook friends, but all but one (Manuel Zabraniecki) have deserted him since the scandal broke. A couple fan clubs have popped up since, and this looks like his real Facebook profile (it's sparse with no picture). So...want to be friends?